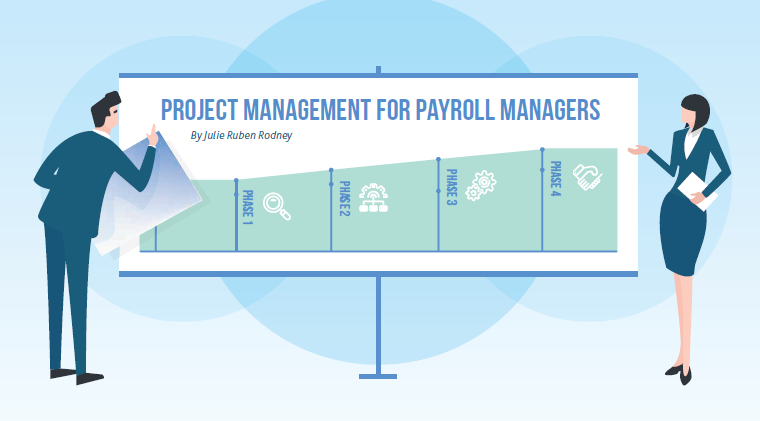 How to Manage Your Payroll Projects More Effectively. Do you sometimes feel overwhelmed and not in control of a project that you are managing? As a payroll professional, your job can be very challenging as you are required to wear a variety of hats, juggle multiple projects and work with different stakeholders. Achieving project goals and objectives while managing the project’s triple constraints of scope, time and cost — is a common challenge facing many payroll professionals today. In order to successfully manage a project, it is essential for you to have clear objectives, a good project plan, a controlled scope and have stakeholder support. There is a science to ensuring projects are executed successfully. Here is a guide to help you manage your payroll projects more effectively. During the Initiation Phase of the Project Life Cycle, it is very important to first identify the project objectives and goals. You need to create a Project Charter, a document that states the purpose and requirements of the project, including approvals by the client or senior management. > WHO is the client? > WHAT is the end product or service? > WHY is the project required? > WHEN must the project be completed? > WHAT is the cost of the project? holders should be addressed in a project plan. During the first phase, the major deliverables and all participating work groups are identified, and the project team begins to form. The Planning Phase is the second and most important phase in the Project Life Cycle. The effort spent in planning can save countless hours of confusion and rework in the subsequent phases. The focus here is to develop a roadmap to guide your team through the Execution and Closure phases of the project. During this phase, you should identify the project tasks and required resources and strategy. The project plan should outline the activities, tasks and timeframes. As you are planning the project, remember to prioritize activities to make the most of your time, energy, and talents. Decide how to allocate your tasks based on time sensitivity, preparation required, involvement of others, impact to organization and degree of difficulty. Also, keep in mind the 80/20 Rule; spend 80% of your time planning and 20% implementing. Ensure all work groups understand their roles and they are clear on the budget, timeline, and quality expectations. Risk management is a fundamental step at this stage. Look at what might pose a threat to the successful completion of the project by identifying high-threat potential problems and how you could prevent the problem from occurring in the first place, or to reduce the impact on the project if it does occur. During this phase, the project plan is put into motion and the work of the project is performed. This is the longest phase in the Project Life Cycle and it typically consumes the most energy and the most resources. This phase involves completing project deliverables and presenting them to stakeholders for approval. change management. At this stage, you will choose how to mitigate and respond to risks identified in earlier stages by using the guidelines from your previous planning while continually monitoring these risks. Quality should be maintained throughout and there are several tools that you could use to help keep track. Meeting stakeholder expectations is manageable if all communication channels are open as any miscommunication may be time-consuming and costly. To accomplish a clear line of communication, ensure it is frequent and meaningful and seek feedback throughout the life cycle of the project. During this fourth and final phase, final project deliverables are handed over to the stakeholders and users. Closeout is the process of finalizing all project matters, carrying out final project reviews, archiving project information and redeploying the project team. be done differently next time to proactively prevent similar issues. Look at what went wrong that should be “red flagged.” However, it is also important to focus on the positives. Questions such as “What did we do right?” should be asked so you know what went well and what you should continue to do on your next projects. Lastly, do not forget to celebrate! Your team has worked hard and celebrating will refresh minds and get your team in gear for the next project.